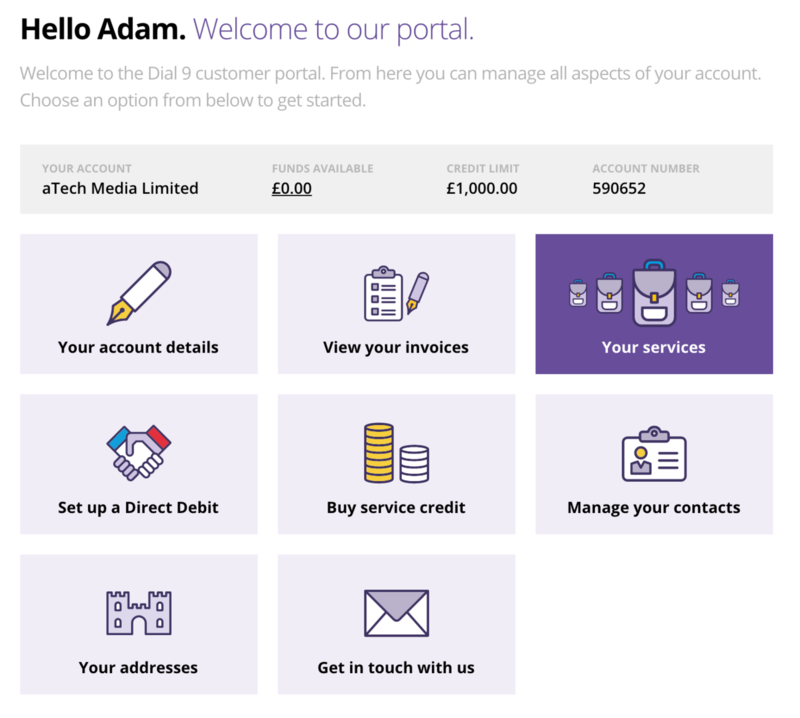 In order to enhance your customer experience, we are pleased to introduce to you our new Account Management Portal, designed to make managing your Dial 9 account even easier than before. Where will I find everything? Your Account Details - Check your full account details, including your current balance and credit limit. View your invoices - View your outstanding and historical invoices all in one place and export PDFs for your own use. Add funds to your account - Top up your Dial 9 account manually by credit/debit card, PayPal or direct bank transfer. Your services - Access the phone system(s) attached to your account directly from the portal. Get in touch with us - Contact Dial 9 if you need any assistance. Set up a Direct Debit - Keep forgetting to top up your account? You can set up a regular Direct Debit instead. Manage your contacts - Keep an up-to-date list of individuals in your business who can contact us about your account. Your address book - Manage the addresses linked to your account. To further enhance your security we have upgraded your user login to include two step authentication. When enabled, we'll send you a text message to your designated mobile number each time you login to confirm your identity. This features ensures that even if your password is compromised your account is still secure, giving you peace of mind your system is safe. The new portal is already live and ready to view. If you haven't had a chance yet, we invite you to login and take a look around, just click here, or navigate from our website using the link in the top right hand corner. Here at Dial 9 we are always looking for ways to improve our products and services so they work best for you. If you've got any feedback on the new portal we welcome your comments. We hope you manage to get around the portal nice and easily, but if you do need a hand, please don't hesitate to get in touch and a member of our team will be happy to talk you through it.